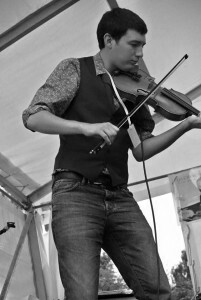 Toby Shaer is an up and coming folk musician from Leigh on Sea, Essex. He is a multi-instrumentalist, composer and producer who has worked and shared stages with some of the finest musicians in the folk/country music scenes. Born in 1994, he started to play music from an early age, picking up Flutes and Whistles at the age of 7 and Fiddle when 12 years old. He began his first band at the age of 14 fusing Irish tunes with Jazz, Rock, Reggae etc. The Toby Shaer band continues to gig with a long list of different resident and session musicians. He has worked with several bands over the years, the most recent being renown Scottish fiddler John McCusker on his 25th Anniversary Tour and BBC Horizon award winner 2016 Sam Kelly with this band The Lost Boys. Despite his age, Toby has already performed around the world at some of the most prestigious venues, including The Sydney Opera House, The Kennedy Centre and The Royal Albert Hall. He has also performed with numerous musicians from a wide variety of musical backgrounds from celebrated Scottish Hero Dougie Maclean to outstanding Blur guitarist Graham Coxon. His future projects include his first solo album, concert and festival dates with Sam Kelly and The Lost Boys throughout 2018 and new projects with KerryPro Whistle maker Phil Hardy, fellow Lost Boy Ciaran Algar and genius Scottish songwriter Adam Holmes.